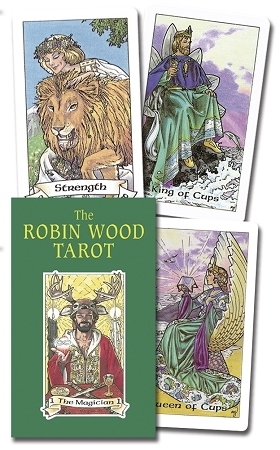 Robin Wood Tarot Deck A Tarot for Pagans and Non-Pagans Alike The Robin Wood Tarot has rapidly become one of the most popular Tarot decks in the world. Its beautiful art, vibrant imagery and luminous energies, enchants everyone. The 22 Major Arcana cards are filled with life that was previously unseen in the Tarot. It is also filled with the energy of nature, taking the images outside of rooms and into the beautiful abodes of the gods. For example, The High Priestess is an ageless woman wearing a lunar headband. Behind her are trees and a darkened sky lit only by the moon. The shining strength of this deck lies in the fifty-six cards of the Minor Arcana. The characters on the cards almost seem to breathe. Often, the cards seem so dimensional you get the feeling you could jump into them. Watch the boy carve pentagrams on wooden disks in the eight of Pentacles. Gleefully help steal blades in the five of Swords. Join in the merry dance on the four of Wands. The 56-page booklet explains everything to give a Tarot reading, including the upright and reversed meaning for each card and 3 different layouts. Each of the pip cards is given a word or short phrase to help you identify the meaning of the card with virtually no effort. Pagans will love the influence of nature on this deck. Beginners will find it makes learning the Tarot fun and easy. Experienced Tarot readers will love the radiantly colorful, symbolic, and infinitely captivating deck. Get your copy right away.